It’s always extra special to visit a school for the first time, so to make two first-time visits in a week was mega! 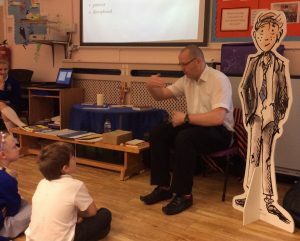 It was lovely to visit St Paul’s at Warton to share my writing adventure with Y2 – Y6. The pupils listened really well as I talked them through the three books and even threw in a bit of storytellin. The session finished with a book signing and the children had more time to ask questions, some of which really made me think! Treales CE Primary is probably one of the smallest schools I have visited. There were around forty children in the assembly and it made for a lovely, close-up experience. After talking through the writing process, I popped in to sign copies of the books for Year3/4 and answer more questions. The children were ace! The next stop was Y5/6 for a writing workshop. We spent time looking at an unpublished piece of writing that will eventually be used in an Impossible Tale. It features a particularly nasty child who causes fear and terror amongst his schoolmates. The children pulled apart my writing then planned out their own version. We even had time to hand over the storytelling waistcoat so the children could read some of the openers at the end of the session. I was impressed! After signing more books, I headed home enthused and energised by the children’s passion for writing. Thanks Mrs Shields and Mr Man for organising the visits. I had a great time in both schools.